I had to try braiding some rickrack, just for fun. It won’t be fun cleaning up now that I dumped my over-flowing trim basket. I have quite a bit of the stuff and even some red and black jumbo that I do not remember. It is the right color combo for my ‘Go Bearcats’ college days; could it be that old? The braiding does need to be pressed to lay flat. However my ironing board is covered in trim, so for the photo the ends are held down with pattern weights. 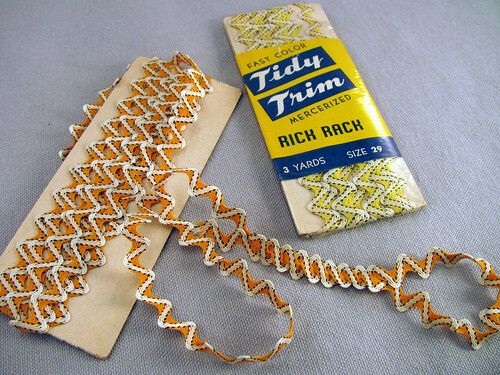 I also found two packages of vintage rickrack. The darker one looks rather interesting braided with itself. 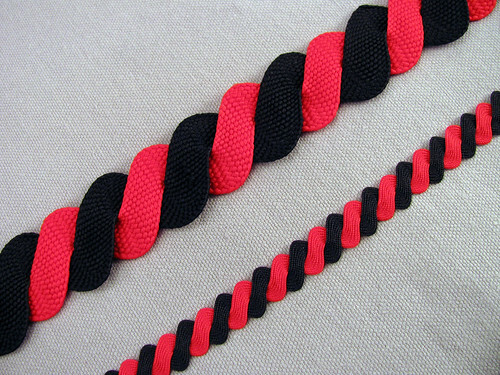 I would like to try the lighter one as the rickrack lace, maybe using some black thread and beads in the centers. Both packages have been waiting a long time for a project, so I have to find a special one for each. This entry was posted on Sunday, January 25th, 2009 at 3:00 am and is filed under Sewing. Tagged: Craft, Fabric, Needlework, Notions, Trimmings. You can feed this entry. You can leave a response, or trackback from your own site.